What does a dignity violation feel like? Wait a minute…foment a revolution?! Someone struggling with a dignity violation might easily miss the last phrase of the passage, but it’s actually a prime avenue toward positive change. Fomenting a revolution to embrace human dignity sounds like a pretty darn good idea, so long as it is done peacefully and, well, with dignity. (In other words, we don’t want heads to roll literally.) It sure beats turning our anger outward or our pain inward. And if we’re talking about revolutionary energies, then let’s make sure it applies to the workplace. 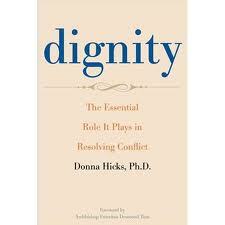 If human dignity became the baseline of our interactions at work, then how would that transform our organizations? Imagine how much happier, healthier, and more productive we would be! These book reviews wil kill by budge and I am in fear of being a hoarder! Thank you for brining up a good point with bullying . Dignity matters. The most empowering statement one can make once their dignity has been disparaged is to take action.